Applicants must be members in good standing of the APP Mahoning-Shenango Chapter and an active member of a committee or board. Events that qualify for a scholarship grant must be related to the fundraising profession. Priority will be for AFP or NCPG programs. The size of the grant shall be related to the total cost of the event, but in no case shall the Chapter pay the full amount. The maximum amount you can request is 50% of the total costs up to $500 max. Grants may be sought at any time during the year. They will be acted upon as soon as feasible by the Scholarship Committee. Generally, a member may apply for only one scholarship grant over the course of the calendar year. Large amounts for regional or national events (over$500) may be requested every other year. The recipient is expected to submit all receipts to the scholarship chair or the treasurer within a 60-day period following the event. Mileage will be reimbursed as per the current IRS rate. 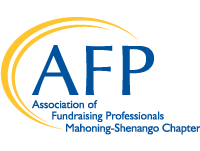 The AFP Foundation for Philanthropy is again proud to announce the Chamberlain Scholarship program for the 2020 AFP International Fundraising Conference. The Chamberlain Scholarship covers the recipient's conference registration fee, minus a $10 processing fee. The AFP International Fundraising Conference on Philanthropy is to be held March 29-31, 2020, in Baltimore, Maryland. The scholarship is available to individuals who have never attended an AFP International Conference. Our AFPMASH Chapter offers an additional scholarship of up to $750.00 to cover travel, accommodation, and miscellaneous expenses. We encourage you to consider this extraordinary opportunity to advance your career. Attached is the Chamberlain Scholarship Application. The deadline for the Chapter President to submit your application is October 31, 2019 so if you are interested in applying for the scholarship, please email your completed application to sfreaney@libraryvisit.org no later than September 30, 2019.